Karen performs an original scripted monologue with improve accordion at San Francisco’s Litquake with the Quiet Lightning series. Karen Penley is an actress, writer and director. Well cast for: Mental Patient, Homeless, Addict, Hillbilly, Prisoner, Mystic, Peasant, et Cetera. Karen recently moved to Los Angeles where she is pursuing a career as an actress. She has been cast as an inmate in a mental asylum, a recovering alcoholic and a hillbilly in short films and music videos and is seeking representation. 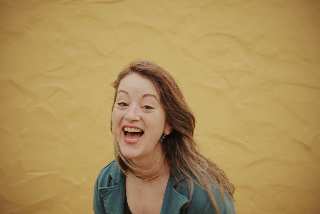 She has written and performed her own material on many stages including Litquake, Lit Crawl, Get Lit, Generations, Beast Crawl, Story Squared, Milkbar and many other variety and literary events around the Bay Area. She has hosted and performed in her own series, Retard: The Church Shows which ran weekly for a year as well as Meet the Beat: a music and literary event that ran for 2 years through Venue 9 in San Francisco. She wrote, directed and produced two full length new circuses: Circus Proboscis: A Sneeze of Freaks and Not the More Lovely: A Circus Sideshow. Each had a cast of actors, singers, dancers, animation and an accompanying music score performed live by the Bill Horvitz band and 20 Minute Loop. She won a Theater Bay Area Cash Grant and was well reviewed by the SF Bay Guardian. She was directed by John O’Keefe in an original show, Luna, which is based on one of Jung’s famous cases about a woman who believed she was in love with a vampire on the moon. She created and starred in her own solo show, Feral Girl, about a runaway living in a basement with an old man who was shoes.